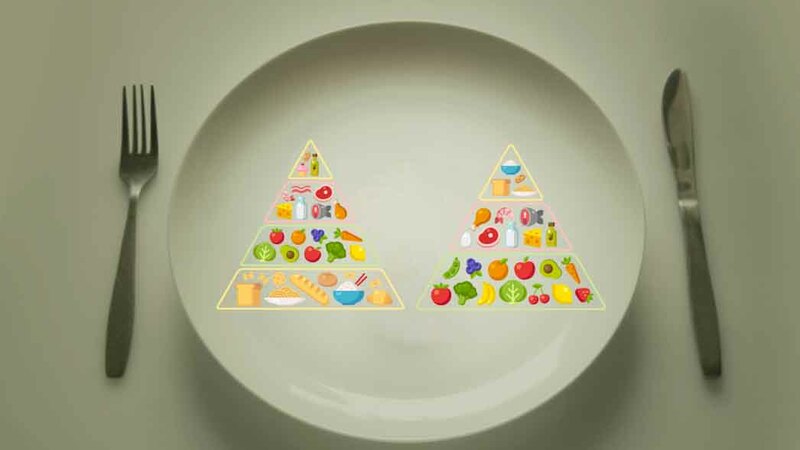 Interesting, huh – firstly, sugars and high GI and processed foods aren’t even included in the food pyramid. We don’t need them. It’s that simple. Next, notice how whole grains are INCLUDED with other complex carbohydrates such as legumes and beans. So according to THIS pyramid, cutting out grains is NOT cutting out a “gasp” entire food group. You are not going to get all pale and malnourished by not eating grains – there are LOTS of non-grain sources for Low-GI complex carbohydrates and fibre. Also, notice that lean, organic protein sources are much further down the food pyramid, and are included together with vegetable protein sources, but NOT included are the high fat protein sources. And interesting how vegetables are at the bottom – meaning, eat the most of. Notice also how the main vegetable are not the starchy vegetables like potatoes and corn but above ground and green leafy vegetables. Eating lots and lots of vegetables, accompanied with lean, organic protein (both animal and vegetable sources), accompanied with whole foods like quinoa, healthy fats and fruit is a healthy diet, period. End of story. Living proof of this is recently Jason and I went and had blood tests done – both of us had excellent everything – vitamin and mineral levels, cholesterol normal (despite eating lots and lots of nuts, seeds, eggs, olive oil and coconut oil), we are both at normal healthy weights, look years younger than our age, with clear healthy skin. This is despite Jason having Crohn’s disease. We were recently told that despite his severe scarring of his entire small intestine, he has none of the poor absorption and vitamin deficiencies usually seen in patients with Crohn’s. Also interesting.